Near the end of last term, I made the decision that going forward, I would make a small cabinet along side my students. This isn’t unusual, I have been doing this since the school was conceived. What was to be different was the wood. In the first term at the school, students make a small exercise cabinet in poplar, which I have made along side them to demonstrate the various methods covered in The Fine Art of Cabinetmaking by James Krenov. This term, I will make a different cabinet, in a different wood. A few weeks back, I broke out the stock for my cabinet. 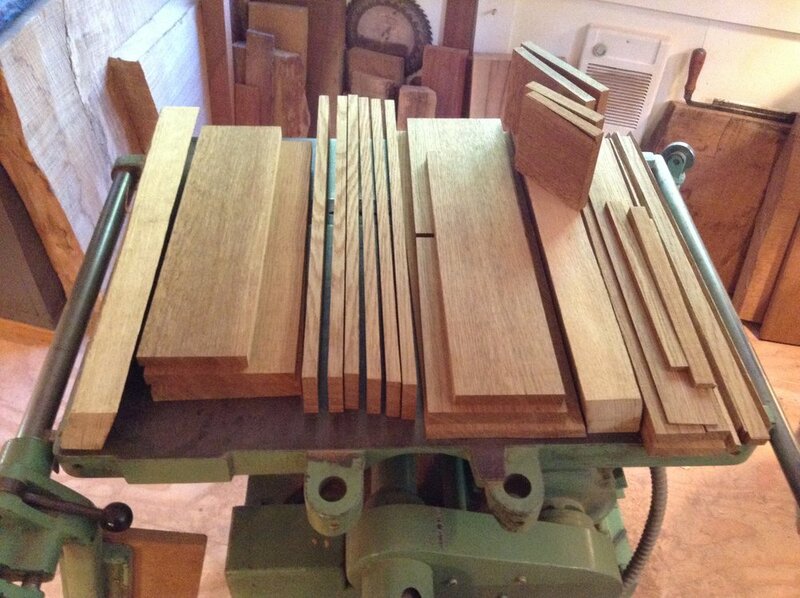 After making the utility shelf supports for Yvonne’s sewing room, I had a taste of the brown oak, and wanted more. The last of the brown oak we had picked up, several of the pieces were fifteen feet long, and had to be cut down to get them into the school. Some of the shorter pieces I stashed away in my workshop at home. I looked through the planks in my workshop and decided on a small plank. I took my block plane and scrubbed the surface. The colour was rich and warm and the grain was particularly nice toward the sap wood. Although quite different from the wood I used for the shelf supports. I thought for a while about incorporating the sapwood in the piece but in the end, the contrast was just too strong, I was looking for something calm. I went to the bandsaw and removed the sapwood, following the annual rings, enabling me to shift the cuts, when resawing so I was able to take full advantage of the beautiful grain. As with most of the brown oak we see, there were a lot of defects but what was usable was gorgeous. I began looking for the doors for the cabinet. Jim suggested that if the doors were not beautiful, there was little hope, for the cabinet. I resawed the stock a few millimetres thicker than the the thickest part of my door, and watched the kerf carefully as the cuts were made. There was almost no movement in the wood. This is the joy of using old wood. It is very dry and all the much of the internal tensions have eased. With the doors selected, I then found the rest of the case. I really enjoy this the flexibility of composing in this way. Near the center of the plank, in the flat sawn section there was a lot of checking. The cabinet will have a frame and panel back and I worked around these checks and cut the stock perpendicular to the grain giving me quarter sawn frame stock. At school the first term students and I fit our drawers, made and fit the frame and panel back to our cabinets, and began work on the sawhorses. In the time between lectures and assisting the students, I began work on the set of chairs in narra, I began a while back. I finished roughing out the crest rail blanks, and finished the rear seat rail joinery. Over the next few days I will pick away at completing the shaping on the back legs. The narra is lovely and will make a fine chair, but not nearly as strong as the white oak the originals were made, so I have made all the parts a trifle larger than the originals. I can adjust the visual weight when I get to the edge treatment. With less than two weeks left in the term, despite the diminishing daylight, the evenings are getting longer and the mornings earlier. Over the years I have come to enjoy this time. Sunday I will head into the school and prepare the millwork for next term. In my own workshop this past week, I crosscut the supports to length, and dialled in the fit of the notch. I am heading out after I write to finish the shaping before turning my attention to the shoulders on the twin live tenons, which need a bit of work. Life is busy but good. In the words of Eva Zeisel, “My hands have remembered something remembered. Not my mind but my hands. This past week, the first term students and I made drawers for our little cabinets. When we begin, I remind the students, that work of this sort is among the most personal work we do. The way we hold a chisel in our hand, the sensitive touch as it shears the fibres as we approach a fit. The way a tail is carefully fitted to the sweeping inward curve of the pin is a beautiful thing, something that can only be created by the human hand. This morning as I sat at the front bench preparing for my morning lecture, I looked around the room and all my students were working at their benches. It was focused yet relaxed vibe in the school. I am so grateful for my life and work. When I returned home this evening after my beautiful after class walk by the sea, I spent some time in my workshop before sitting down to write. I am making some utility shelving for Yvonne’s sewing room. I am using a few bits and pieces of brown oak left from Andi’s showcase cabinet. They were all to small to run over the machines, so I dimensioned each of the pieces by hand, before cutting the joinery. This is an exercise that we do often at the school, and a skill that is invaluable in our craft. 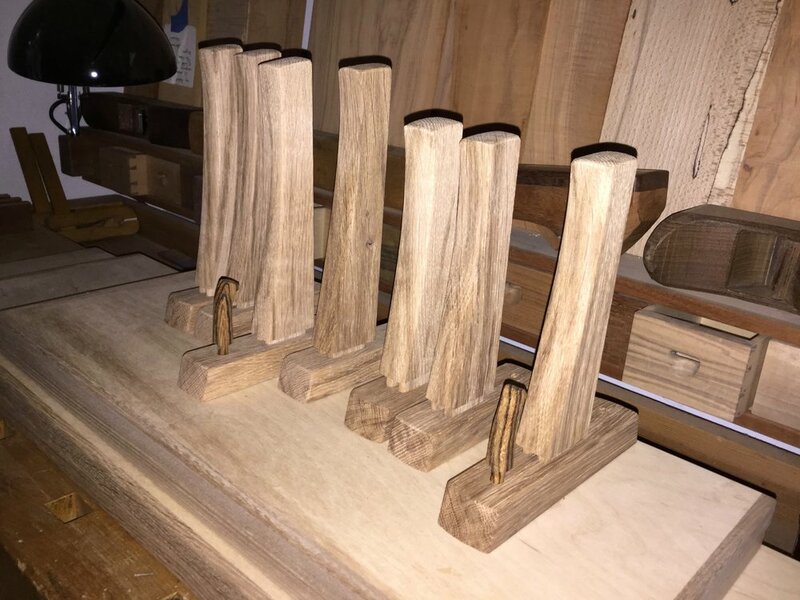 I have them roughly shaped and have carved a few hooks where they will be useful. The bocote is from a small piece from Jim, and in time will age beautifully along side the oak. On the first day of the program, I shared a short passage from a book by Thich Nhat Hanh in which he suggests that he is a poet, but for him to write poetry well, he needs to grow lettuce. I believe this to be true. I am a teacher, but for me to be a good teacher I must and spend time at my bench. I spend my days in a beautiful place surrounded be aspiring amateurs, and my evenings, weekends and breaks in my beautiful workshop.